would love that steel cable railing on my deck...how can i find info? Pre-assembled, pre-packaged Ultra-tec® cable railing kits are available at building supply stores throughout the U.S. Contact the dealer in the city nearest you for more information. Click here for a list. Wood - What wood other than pressure treated pine is recommended? 7. Choose Railings That DisappearIf there’s a grade change between your deck and the ground (even if it’s only minor), you will likely need to install railings to comply with local building codes. 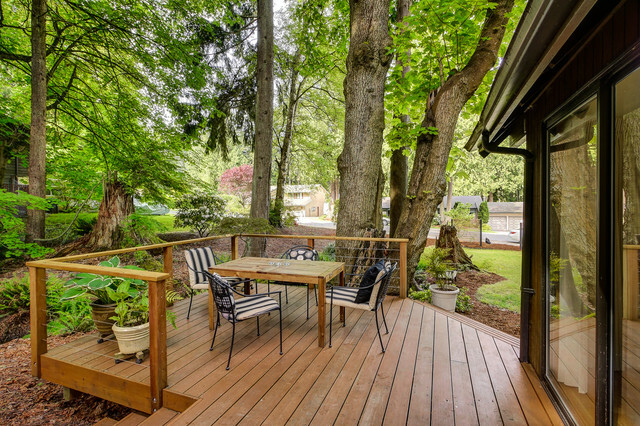 Small decks can feel more cramped if surrounded by heavy railings. Instead, choose a style that appears light and open, like the cable railing surrounding this Seattle deck. It seems to disappear from view, expanding the perceived deck boundary and allowing one’s gaze to move out to the garden.